← Super Tip Tuesday: Time To Clear Out The Clutter, But First…. It’s time to get real! It’s time to live in your truth! No more beating around the bush. Stop giving it another name. This isn’t about judgement. No it isn’t. This is about being fully who you are and admitting it to yourself. This isn’t about beating yourself up about it. This is about knowing who you are and what you do or don’t do. See the good news is you can become UN-LAZY. HA! You can become MOTIVATED. You can change. I always say admitted is one of the first steps and not feeling bad about yourself because of it.We all have weaknesses and strengths. Weaknesses are a part of who we are and turning those weaknesses upside down into strengths is a glorious thing!! 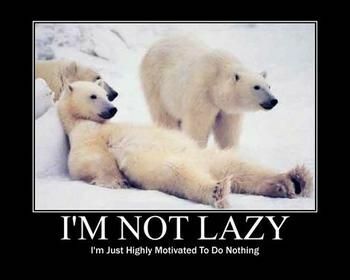 If you are lazy, then admit it!!!!! And now vow to change that…….